The photographs of the site of the former National Aerated Water Co. used in this post were taken during a private visit organised by the Urban Redevelopment Authority (URA) for invited guests and have been used with the kind permission of the site’s current owner. Do note that the site is not opened to the public. 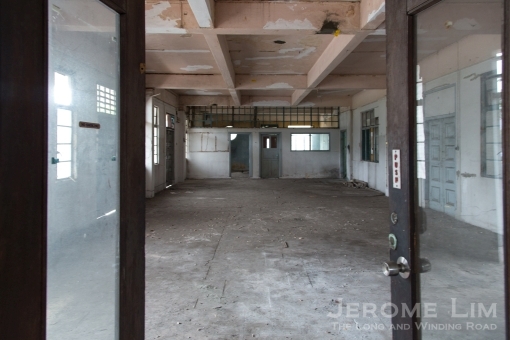 Disused spaces bring great joy, even as in the case of the former National Aerated Water Co’s bottling plant at 3MS Serangoon Road, the paraphernalia associated its use has long been removed. There is much to learn from the spaces, especially those that were conceived with little in way of frills in an age of greater simplicity. The disused plant, fronted by an art-deco-esque tw0-strorey structure placed along a thoroughfare that would have been hard to miss, last saw use some two decades ago. Associated with the bottling of two popular soft-drink labels, Sinalco and the joy in a green bottle that was the comic strip inspired Kickapoo Joy Juice, there are many now who look back fondly at the now empty building that is one of few constants in an area that has seen much change. The art-deco front of the former factory is a rare constant in an area that has seen much change. 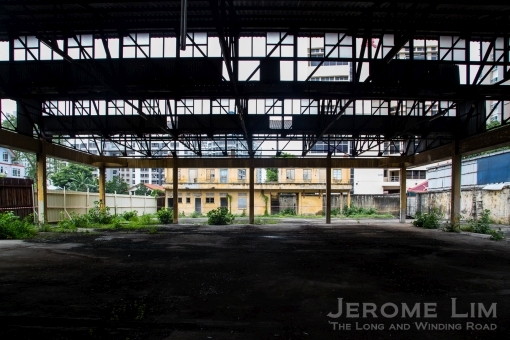 The good news we heard just last week was that a portion of the former plant – its front – is being conserved. 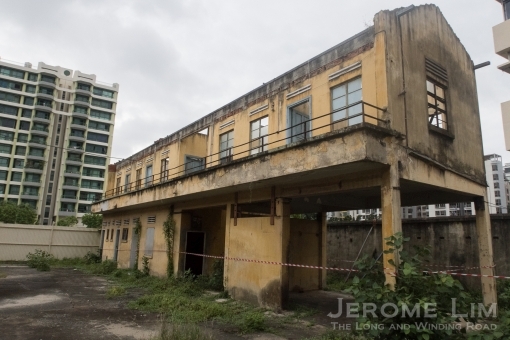 Selangor Dredging purchased the site for residential redevelopment just last year and has over the year been working with the URA on the conservation of the former plant’s most recognisable feature and its face – the art-deco main building. 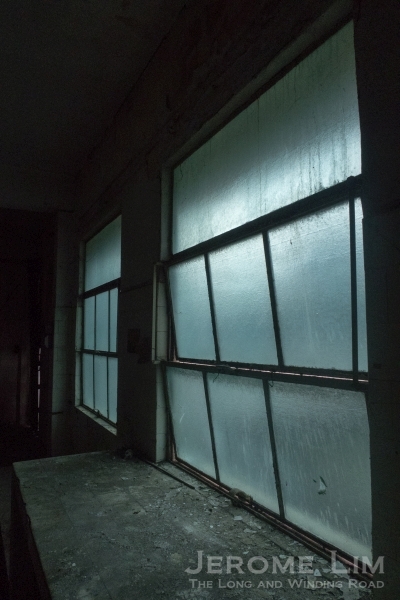 The disused factory offers us a window into the past. The factory, of a 1954 vintage, last saw operations some two decades ago. Built at a time of increasing demand for soft drinks, the home-grown company’s new plant found immediate success. The investment in the state-of-the-art factory and bottling equipment on the company’s 25th Anniversary was motivated by Sinalco’s 1952 award of exclusive bottling and distribution rights. An interesting nugget of information was shared by the URA about the rather peculiar name of the German drink was that it was derived from the words “sine alcohol” or without (in Latin) alcohol. More on the plant and the company can be found in a previous post: Losing its fizz: the third milestone without the former National Aerated Water plant. 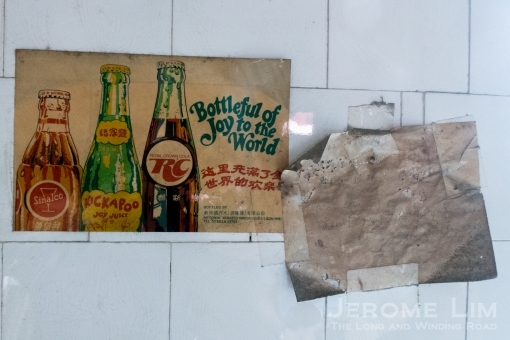 Writings on the wall: soft drinks bottled at the plant … plus a secret formula perhaps. 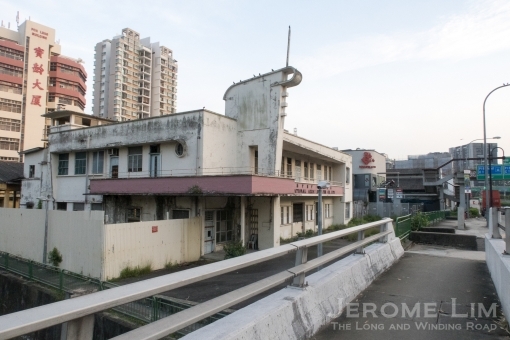 The L-shaped building being conserved was where the company was run from. 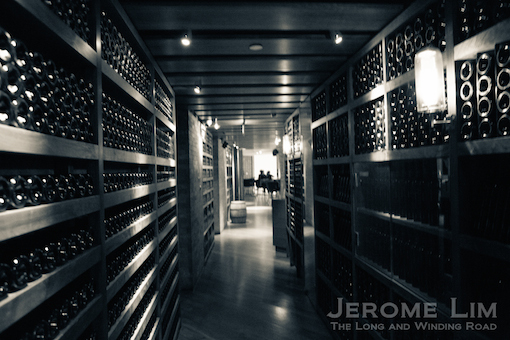 Offices and a mixing room were located on the upper floor and a reception, the storage area and distribution spaces on the lower level. 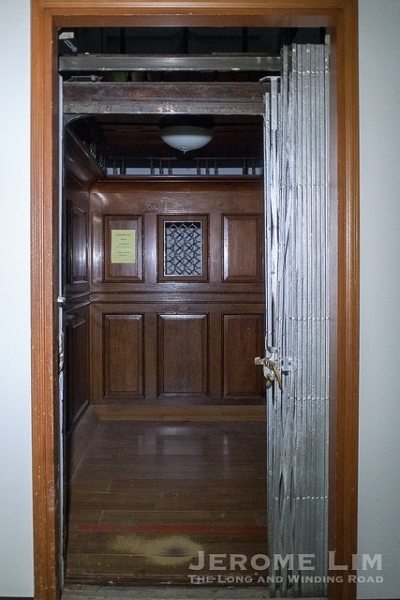 The conserved building has several interesting features. These include a purpose designed “signage tower” on which the Sinalco logo was emblazoned, a tapering balcony at the front with a fair-faced brick parapet facing the road on which the company’s name is mounted, and a built-in sun shade projecting out from the building’s side that spirals out of a circular window (see: Conserved features of the building at “Former National Aerated Water Factory building to be gazetted for conservation” identified by URA). Parts of the building will have to be rebuilt. This includes the southeast corner, which will have to be knocked-down to permit vehicular entry to the site for construction. A sun shade or concrete, spiraling out of a circular window. Office space on the upper floor. 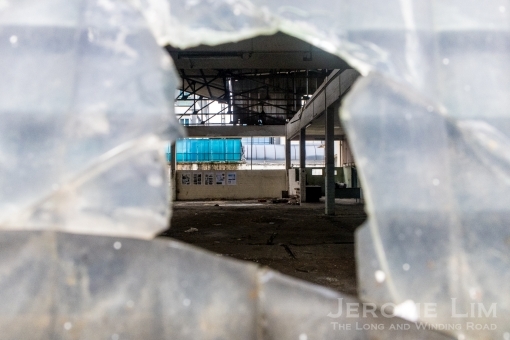 Redevelopment will take place on the site just to the rear of the conserved building and this will see several structures removed, including the wide-span steel truss supported roof structure under which the main shopfloor of the plant was sited. 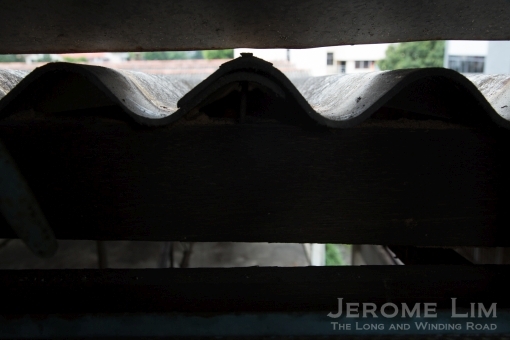 This roof construction, topped with corrugated roofing sheets, has ample window covered openings built in to it to maxmise the entry of light and ventilation. 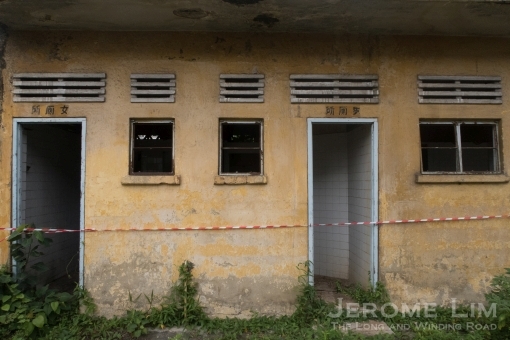 An auxiliary building, that would have contained service spaces including toilets that can still be seen, can be found close to the rear perimeter of the site. 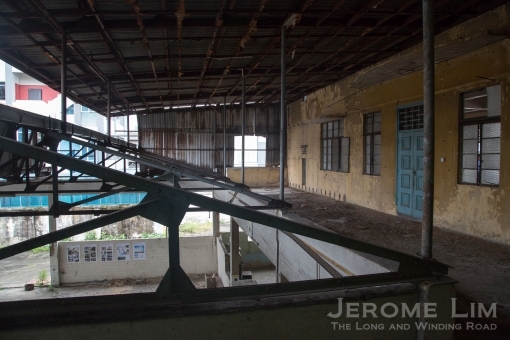 The shopfloor and the roof structure through which light into the factory was maximised. The building at the rear of the site. A last reflection. The reception area at the southeast side of the building. Windows from the past into the present. The tapered front facing balcony. 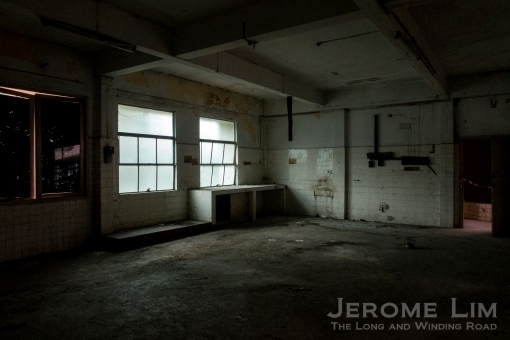 The rear of the office space – which overlooked the shopfloor. Part of the roof structure can be seen. Timber doors and matching ventilation grilles above are seen on the outward facing boundaries of the main building. A view from the former shopfloor towards the main building. The right portion of the building was where crates of soft drinks were stored and dispatched. The southwest side of the building. The part of the building that will be reconstructed. The office space on the upper floor. A view out the back of the office space towards the roof and the shopfloor below. 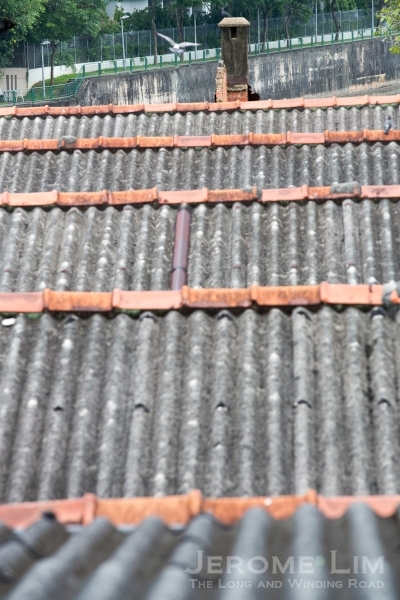 A close-up of the corrugated roofing sheets. Frosted or textured glass is in evidence throughout to filter light that would otherwise have been too harsh. Close-up of a textured glass panel. A view over the top. Dead slow ahead. The part of the factory that will be demolished as seen from the driveway. 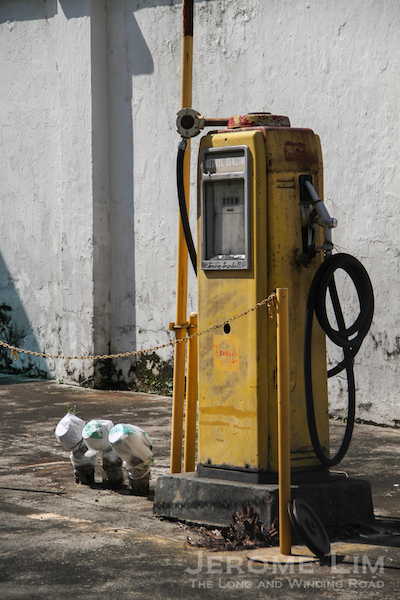 The pump at the driveway, which is visible from the outside. Comfort facilities at the rear. Yay! 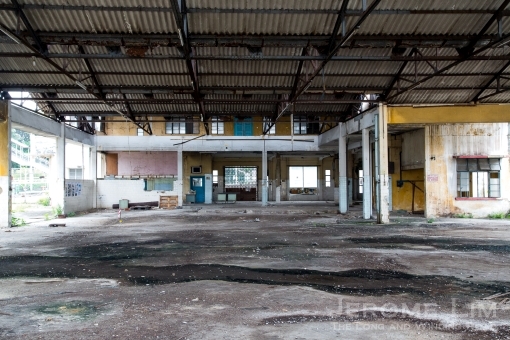 The former National Aerated Water Co. plant is being conserved! Notices in the back pages of the press can sometimes bring joy. 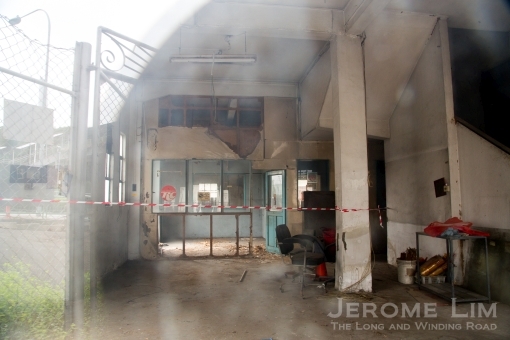 More on the plant, the social memories connected with it, and its history can be found in this post: Losing its fizz: the third milestone without the former National Aerated Water plant. 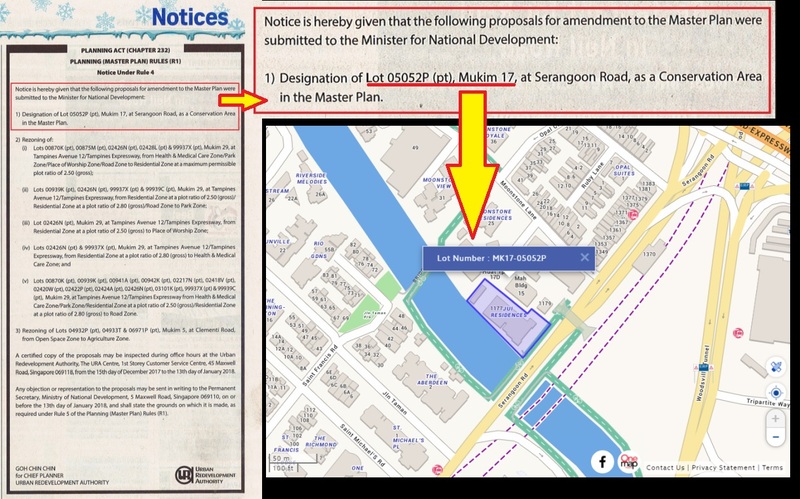 The notice on page C16 of today’s Straits Times and the lot as identified on OneMap. 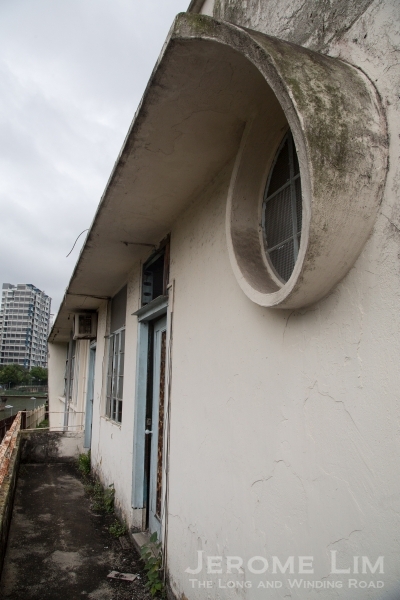 The former National Aerated Water plant by the Kallang River. 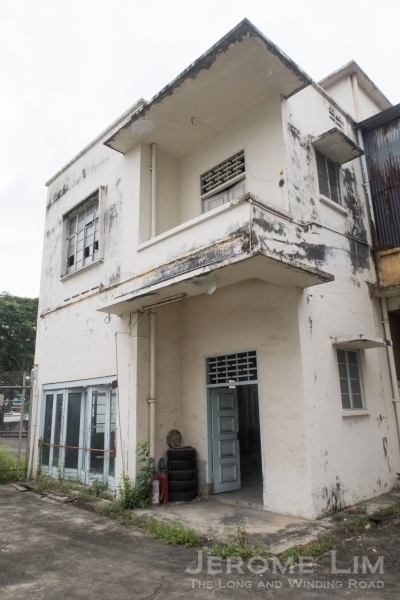 *A press release issued by the URA indicates that the conservation will be of the two-storey L-shaped main building facing Serangoon Road. Part of the conserved building (I suppose the corner where the road access now is) will however have to be demolished and reconstructed to allow vehicular access to the rear of the site. The corner of the building that would have to be reconstructed. 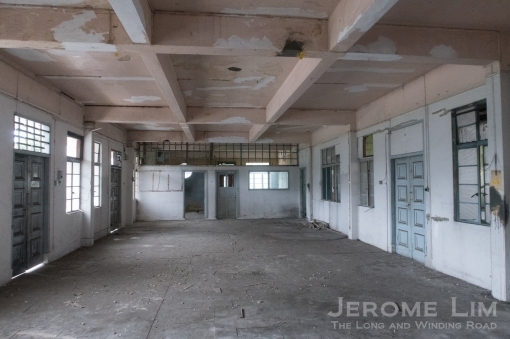 The two-storey L-shaped main building facing Serangoon Road will be conserved. This includes the signage tower, a representative feature that many will be familiar with. 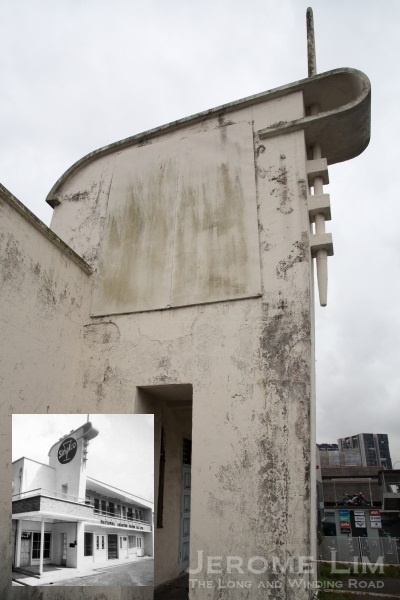 Other significant features are the balcony with fair faced brick parapets, the Art Deco timber transom panels and the concrete sun shading ledge that spirals out of a circular window. 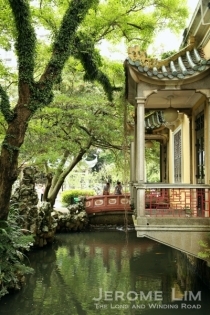 Retaining heritage while meeting Singapore’s development needs in land-scarce Singapore requires a delicate balance. The conserved building will be integrated into a new residential development, allowing the story of the building to be brought to life through adaptive re-use. 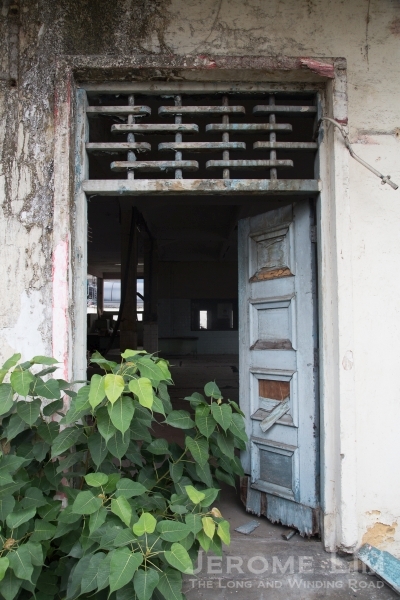 The conserved building will be kept fenceless along the main road and the river, giving the public a chance to get up close and personal with this heritage gem from Singapore’s past. 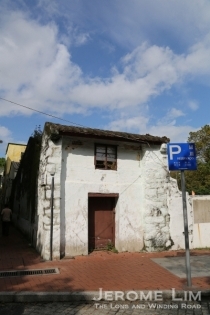 To facilitate adaptive re-use of the conserved building and allow vehicular access to the rear of the site, reconstruction of a corner of the building and the internal floors will be required. URA will work closely with the building owner to guide the reconstruction when the residential development is completed. 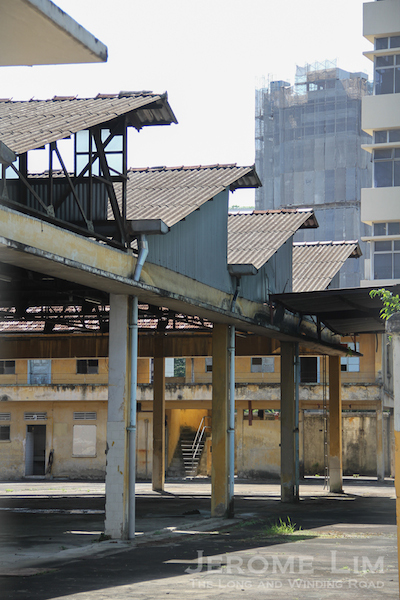 As part of its efforts to celebrate Singapore’s built heritage, URA works with owners of developments, stakeholders and the larger community to tell stories of days gone by involving our built heritage, such as for this National Aerated Water Factory building. Members of the public who wish to be our partners in promoting the heritage of this building or share their memories of this building can write to us at URA_Cons_Portal@ura.gov.sg. 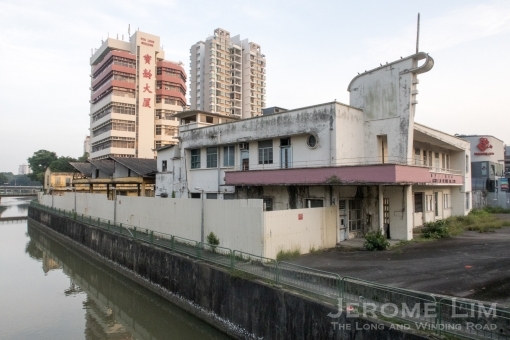 It seems that time may finally be called on the former National Aerated Water Company’s bottling plant at 1177 Upper Serangoon Road. Long a landmark at the 3rd Milestone, it sits on a valuable freehold site that has just been sold for quite a tidy sum to a Malaysian developer according to on a report in yesterday’s Straits Times. 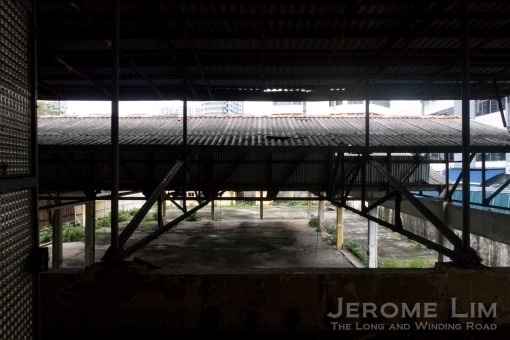 One of a handful of structures left along a stretch of the Kallang River that recall the river and the area’s rich industrial past. An icon at the 3rd Milestone (Nov 2016). Those of my vintage will remember the plant with fondness. Built with hints of an Art Deco influence, it will not only be for its unique and “un-industrial” appearance in the context of the industrial buildings of a more recent age, but also for its production of Kickapoo Joy Juice and Sinalco. Kickapoo in its signature green bottle and inspired by the comic strip Li’l Abner – which had a lengthy run in the local newspapers, was an especially popular choice. Sinalco, of German origin, might have been less so, but had its fans. A third drink that would be introduced by the plant in the 1970s, Royal Crown or RC Cola, had much less of an impact. 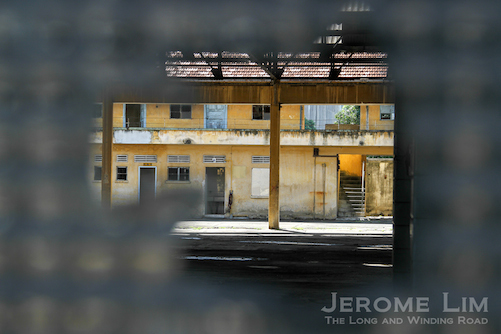 A view through the fence to a reminder of the past (April 2012). While one could quite easily miss noticing the row of shophouses just up the road with its stone working shops that catered to the demand for headstones and religious statues from Bidadari cemetery just a mile down the road and an oddly located shop hawking Czechoslovakian Petrof pianos; the factory and another iconic structure nearby, the Serangoon Fire Station, would have caught the attention of most who passed through. The rather notorious Woodsville junction or previously roundabout just down the road, where chaos reigned with its confluence of six major roads, brought traffic to a slow enough crawl, allowing for more than just a cursory glance at the plant. The factory added its presence in 1954, the same year the National Aerated Water Company had marked its 25th anniversary. The investment, amounting to some S$500,000, gave the company an output to 48,000 bottles a day – more than twice what its previous plant at Hamilton Road could manage (see New $500,000 soft drinks factory opens in Oct, The Straits Times, 23 July 1954). The motivation for the new plant was the exclusive rights the company had won in 1952 to bottle and distribute Sinalco in the region. Sales of the company’s products grew at a phenomenal rate, increasing 30% year-on-year through the new facility’s first decade. A second plant would built in 1964. 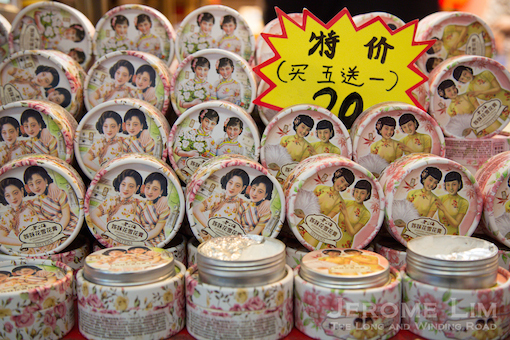 Located in Petaling Jaya near the “Rothmans Roundabout”, it catered to the growing demand up north. 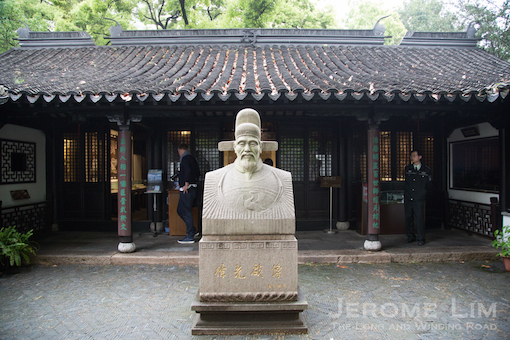 A peek inside (Apr 2012). Things began however to head south at the end of the 1970s. The death knell for the plant would be sounded in the 1990s when the Kickapoo licensor, Monarch Beverage, cancelled the agreement it had with the company. 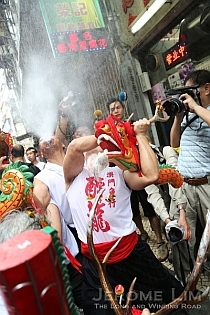 The company would also face a suit for copyright infringement, which it lost (see : Infopedia page on the National Aerated Water Company) and the plant ceased production at the end of the 1990s. The site was left abandoned with a clutter of crates and empty bottles at its front yard for what seemed the longest of times. The front yard cleared of its clutter (Apr 2012). 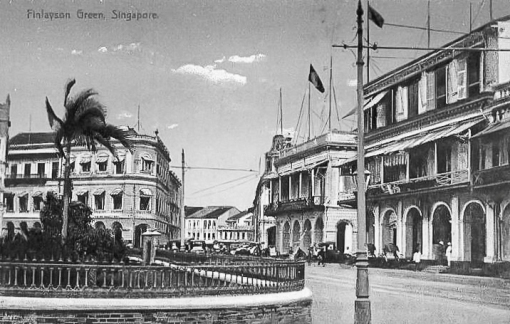 That the buildings are still around has very much to do with the fact that the sale and redevelopment of the site had been prevented by a long standing tussle over shares one of its shareholders, the late Ching Kwong Kuen (see: Ching Chew Weng Paul v Ching Pui Sim and Others  SGHC 277) had placed in trust with one of his brothers and a niece. 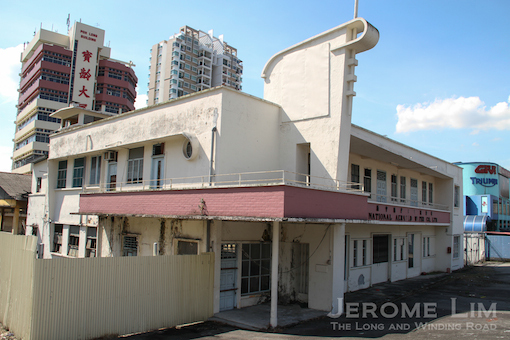 The Chings, whose roots were in steel work and ship repair business with Kwong Soon Engineering, interests in the bottling company began in 1953. 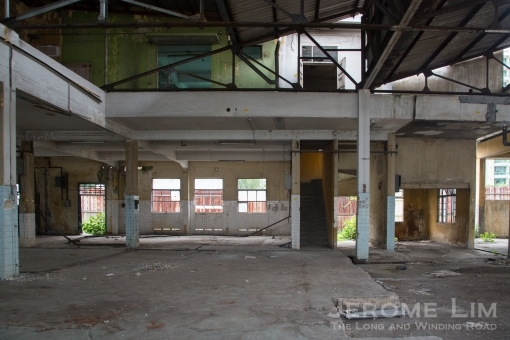 Connected with Kwong Soon Engineering are two other industrial buildings with a non-industrial appearance including a 1933 Art Deco style foundry where it started. Both buildings are still around and found at Cavan Road, which is just next to Hamilton Road where National Aerated’s first plant had been located. Kwong Soon Engineering’s two buildings at Cavan Road, including its former foundry on the left. Kwong Soon Engineering, some might remember, made the news in January 1996 when the RV Calypso, the famous mine-sweeper turned research vessel used by the legendary oceanographer Jacques Cousteau, sank at its yard in Tuas. The vessel was hit by a barge that had broken free of its moorings and left under 4.8 metres of water with only part of its superstructure and mast exposed. Another look at the former foundry. With the privately held site long marked for residential development (with a plot area of 2.8), there seems little chance of anything being kept even if there are renewed calls being made for its conservation. It will certainly be a shame to lose an icon that has long been part of the area’s identity and representative of a past being too rapidly forgotten to just another towering apartment block the area seems to already have much too much of. The third milestone is being colonised by towering apartment blocks (Nov 2016). Your whole life flashes in front of you when you experience a near death moment. Memories come flashing back. Memories of all the good times and bad – and times that one had forgotten or chose to forget come back vividly. Having been in that position almost two years ago there is one strange memory that strangely stood out in my mind and often came back to me after that. It takes me back fifty or more years ago when I was in primary school at the then Holy Innocents School (which later became Montfort School). Those were the days when the Ponggol Bus Company or aka the “Yellow Bus” Company serviced routes in the Serangoon and Ponggol District. My generation of users of this service would remember the wooden louver windows these buses had in those early days! Well, the average daily “pocket money” for school kids our age then was 30 cents. 10 cents for bus fare to and from school, 10 cents for a plate of Char Kuay Teow or Mee Siam etc, 5 cents for a drink and 5 cents for Kachang Puteh or sweets. On certain days after our morning school sessions when the urge for a “cool” after-school treat was high a group of us, living close to each other, would decide that if we walked home we could use the 5 cents saved to buy the refreshing “ice ball” – shaved ice shaped into a ball (like a snowball) and sweeten with various coloured sweeteners and a dash of evaporated milk. This was handmade and looking back was pretty unhygienic but it was a special treat for most of us to quench our thirst. Well the walk from our school, which was next to the Church of the Nativity, back to our homes in Jalan Hock Chye, off Tampines Road, covered a distance of about a mile. We were usually hot, sweaty and thirsty by the time we reach the “kaka” (Muslim Indian) shop that sold iceballs. However walking the last few yards home sucking on an iceball was simply “heavenly” then. 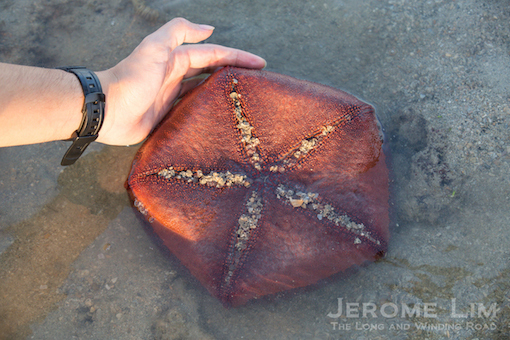 I was in Singapore recently and a strange urge came over me – I wanted to walk the iceball trail again! (I did not think it was the progression of a second childhood coming on). 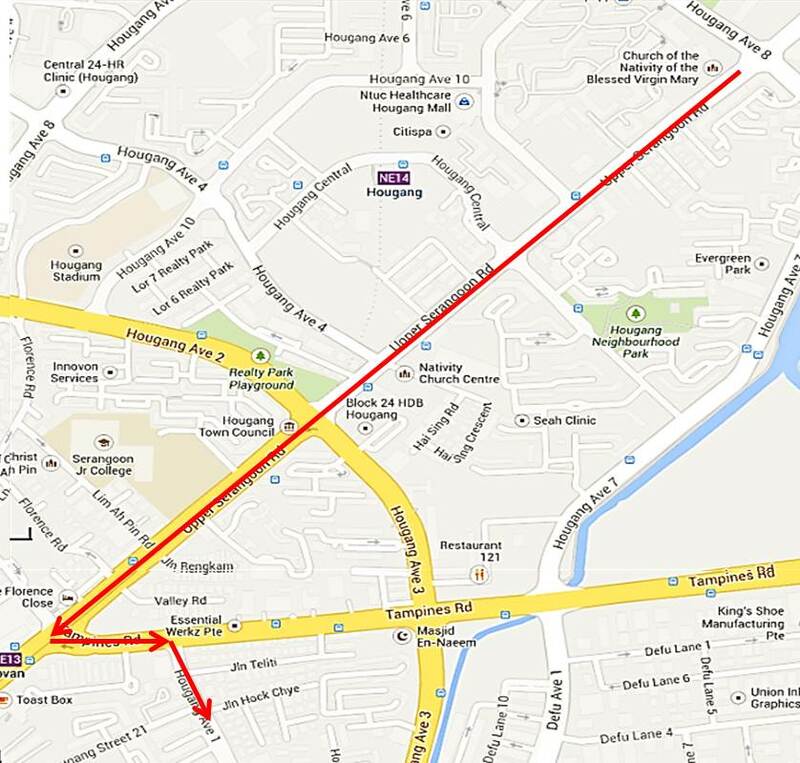 Well on 10th August 2012 I and my wife caught a bus from Upper Thompson Road to Houggang Central to do the trail. Sadly my old school is no more there but the Church of the Nativity is still there and that was my starting point. With camera in hand I recaptured memories of various roads and lorongs that were landmarks then. Fifty years has seen lots of improvement on what was then on a whole a rural environment. Some lanes like St Joseph’s Lane have gone but it was nostalgic to recap what was and still is present. Very few landmarks of old remain. 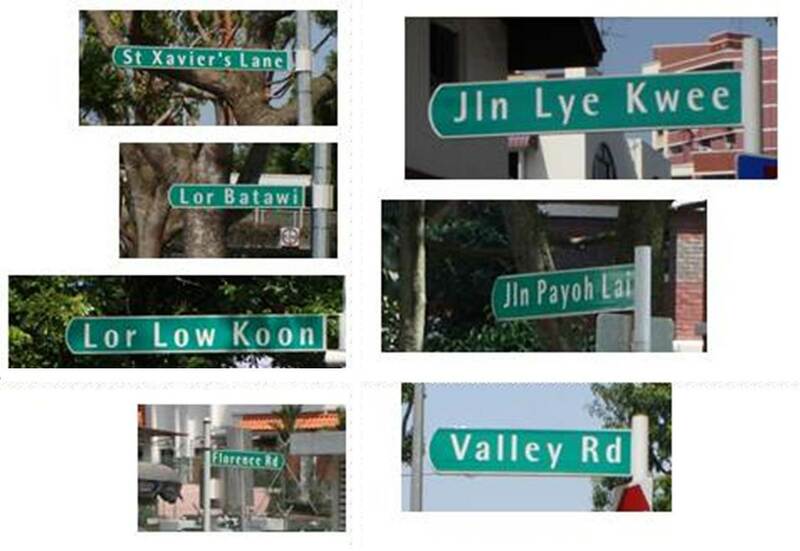 I knew we were getting close to our destination on approaching Lim Ah Pin Road. By then we were thirsty and welcomed a cool soya bean drink at a shop opposite Lim Ah Pin Road before heading for Kovan MRT station. This station used to be the terminus for the STC bus company that ran services into town and other parts of the island in those days. 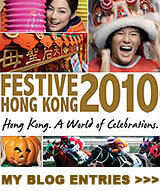 Sadly too Jalan Hock Chye is no more around, being replaced by Hougang Avenue 1. However other landmarks are still there to pinpoint precisely where we used to get our iceballs. The Kaka shop used to be directly in front of the start of Jalan Teliti which is still there; and where my old home used to be is where Block 230 now stands and diagonally across there was a small lane that is now the present Jalan Hock Chye. Well fifty years on I am glad I still could do the ice ball trail again and to all the old Monfortians who did the walk with me then – life was very simple then but very much cherished. However no ice ball for me at the end of the walk this time – had to settle for an ice kachang as a substitute! 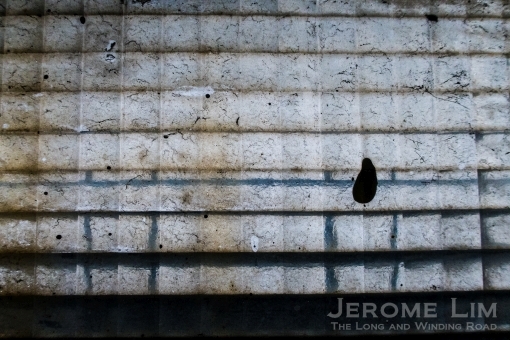 Words and images by Edmund Arozoo, who now resides in Australia and whom I had the pleasure to meet last December. 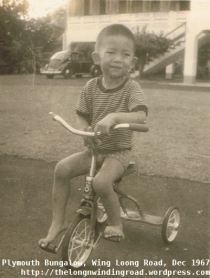 The long and somewhat winding road journeys of my childhood are ones I now look back with much fondness. 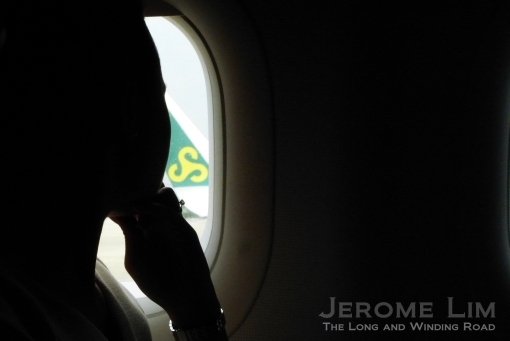 They are ones that were to put in touch with a Singapore that I grew to love, and a Singapore we have long forgotten. One of these drives which would take place during the Chinese New Year and on the occasions we ventured to one of the “ends of Singapore” to indulge in seafood, was to Punggol. Punggol was then a world away where the livestock population would in all probability have outnumbered the area’s human inhabitants. A church which was one of two landmark which marked the start of Punggol. Punggol for me began at the junction where we would have to make a left turn from a busy Upper Serangoon Road even then to Punggol Road. It was at this point that it felt we would leave the built-up world behind and turn-off into what could probably have been considered a countryside we no longer have. 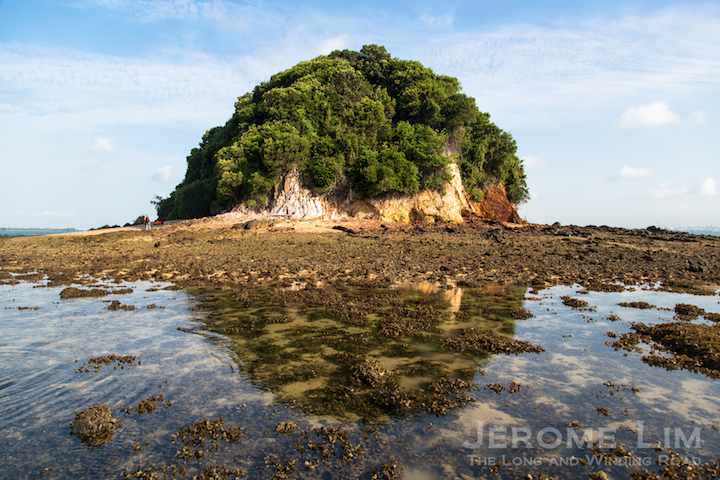 It was where coconut trees seem to dominate the landscape (that at least was my impression) – that I noticed them more than anything else was probably because of the curious sight of many of them without their lightning struck tops – a sight that was in fact common throughout rural Singapore. Coconut trees with their tops struck off by lightning were once a common sight in much of rural Singapore, including in Punggol. 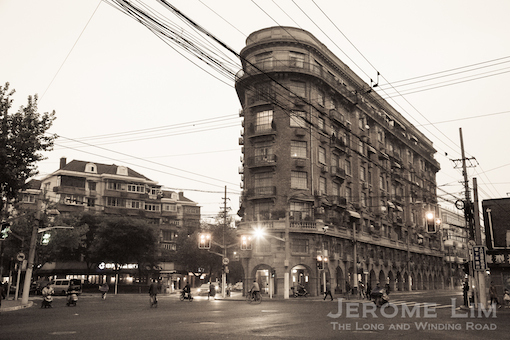 The junction was one which was marked by two structures. One was the St. Francis Xavier Minor Seminary and the other a beautiful church which seemed out of place in the environment around it. And while much of the landscape of the area has been altered beyond recognition – the trees and high-density dwellings of pigs and poultry have now been replaced by towering blocks of high-density human dwellings and the stretch of Punggol Road where the junction is has been renamed as Hougang Avenue 8, the two structures – now looking further out of place in the new environment, are still there to serve as reminders of a time and place we would otherwise have little memories of. Windows into a world we have forgotten. The church, the Church of the Nativity of the Blessed Virgin Mary – Nativity Church in short, is one that is hard to miss, with its steeple rising high above the structures around it. One of several beautiful examples of a legacy that the French Catholic Missionaries left behind in South-East Asia, the church is of a form we seem to have forgotten to appreciate. Several examples of the style, commonly used in Catholic houses of worship built by the French missionaries in the 1800s and in early 1900s exhibit, do exist on the island. These include the Church of Sts. Peter and Paul, the de-consecrated CHIJ Chapel (now part of the CHIJMES complex) and the Church of Our Lady of Lourdes, all of which now feature in the growing list of Singapore’s National Monuments. The Church of the Nativity of the Blessed Virgin Mary is one of several examples of Neo-Gothic church architecture adapted for the tropics. The marble statue of Mary in the foreground is interestingly a gift from Sultan Ibrahim of Johor in 1946. Built in what can possibly be described as a European inspired Neo-Gothic style adapted for the tropics, the buildings are very similar in appearance. Nativity Church which was completed in 1901, is however, the only one that was placed in a rural setting – pointing not just to a pattern of faith of the community in the area, but also perhaps of a pattern of immigration to and settlement on the island of Singapore. The transept which was an addition made in 1933 to the original church building illuminated by the soft natural light of the morning. 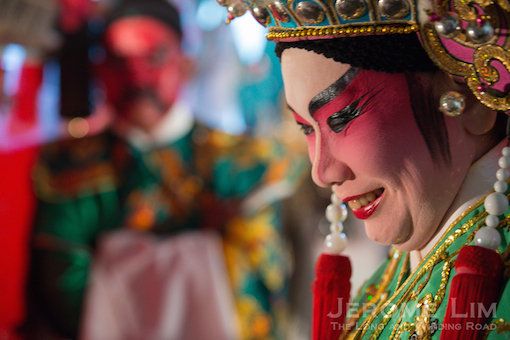 The area is of course one of several rural areas in which the Teochew community, the second largest group of Chinese immigrants to Singapore, was dominant. 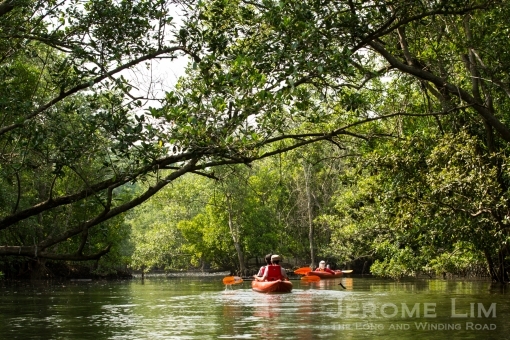 The community, many of whom converted to the Catholic faith as well as to other forms of Christianity, were involved in fishing, in farming, as well as in the rubber (and before that pineapple) plantations through much of the countryside along the northern coast of Singapore. 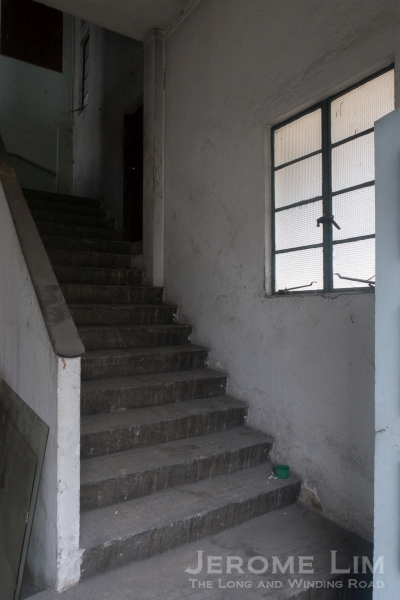 With the community and the adoption of faith, missionaries erected several houses of worship – and there are, as a result, several reminders of this in the form of churches, or in the absence of them, parishes which had their origins in these rural Teochew communities. 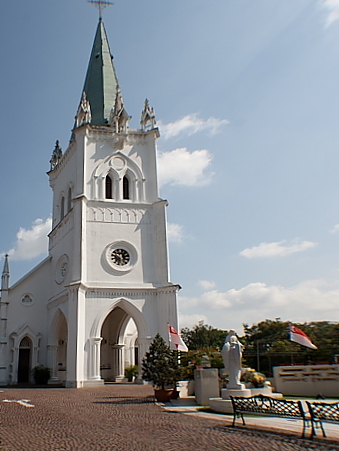 These include the Nativity Church, the Parish of St. Anthony (now in Woodlands) which was previously based off Stephen Lee Road in Mandai, and also a church with a very distinct Teochew flavour in its architecture, St. Joseph’s Church at Upper Bukit Timah Road. Seeing the light – the soft light illuminating the nave – part of the original structure. The background to the parish community, the church, as well as on the architecture of the beautiful building is well documented. Much of this information is available on the church’s website, as well as on the Preservation of Monuments Board’s page on the building. Being a Catholic myself, buildings such as these represent a time when architecture and much of what when on around the church, was dedicated to the greater glory of the maker. 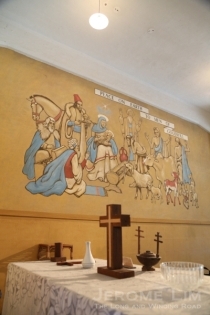 On a personal level, my interactions with the parish and church are limited, coming to the church only on occasion – the last time I did spend some time in it was on the occasion of my sister’s wedding at the church some years ago. The opportunity to step in to the church again came recently when I found myself nearby with some time to spare. A holy water font at the entrance of the church. The nave of the church. Churches are always places where I find a great sense of peace in and in the quiet of the Saturday morning I was there, it was just that I found in stepping through the huge doors at the entrance, finding the interior bathed in the soft natural light of the morning streaming through the generous openings typically found in the tropically adapted Neo-Gothic church design. The church both internally and externally is a visual treat. On the insides, its high vaulted ceiling is accompanied by the rows of arches which would typically line the nave. Focus is drawn towards the Sanctuary bathed in the coloured light of stained glass a building such as this would look bare without. Some of the church’s stained glass windows. The interior with its adornments and furnishings, is a wonderful reminder of how Catholic churches used to be. The dark stained carved wooden pews is a rare find now with most churches around having been built in more modern times. The walls of the transept are where the statues representing the various saints are placed. These are typical of most Catholic churches and in the older ones it would be in purpose built niches as the ones found in this church in which the statues are placed. The windows, which can be opened, provide not just natural ventilation, but also light – typical of architecture adapted for the tropically environment which we do not see in modern buildings built to be air-conditioned. A view down the aisle. A statue of St. John Vianney placed in a niche at the transept. 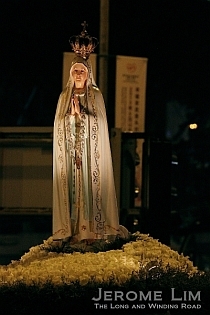 There is a lot as well that is interesting about the church’s history, including that a statue of Mary was donated by Sultan Ibrahim of Johor (the great grandfather of the current Sultan of Johor). Placed in a prominent position in front of the church, that is a reminder of the close ties bewteen the southern sultanate and colony which was once a part of it. 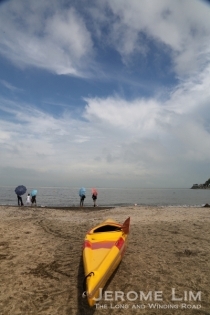 The church today, while serving the needs of the parish community – which is still predominently Teochew, has also reached out to newer migrants – since the end of last year, it is also where the Korean Catholic community has been based at. Coloured glass windows which can be opened allow the church to be naturally illuminated and ventilated. The church in continuing to serve the spiritual needs of the evolving community does stand as a reminder of the purpose it was built to serve. Gazetted as a National Monument since 2005, it is one that will also stand as a reminder of the area’s past, a past which with the spread of the urban world to the area, is one which is increasing hard to remember. 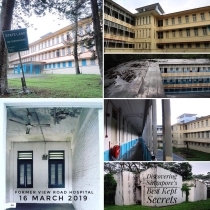 My impressions of the 6th Milestone of Upper Serangoon Road have been shaped not by my experiences with the area, but by my mother’s accounts of the area when she lived there with her parents after the war up until the early 1950s. 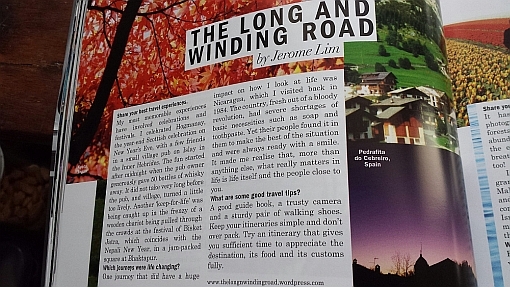 It is an area that I have in fact no experiences in, except in passing through in a car on the regular road trips toward Punggol or Changi that I made in the back seat of my father’s car in my childhood. The 6th milestone had always served as a landmark on the journeys, that was where a narrow Tampines Road started a long and winding passage towards the junction of Tanah Merah Besar and Changi Roads and or course where Upper Serangoon Road continued towards the farming area of Punggol, looking out in particular for the old market that stood in the area. My mother always pointed the market out – the market being significant as a place outside which my grandmother had, in the desperate days that followed the end of the war, set up a makeshift stall to prepare and sell apam balik. She did that for a few years, doing what many others would have done to make ends meet. Once the site of a market that played a significant part in my mother's childhood. There were a few things my mother remembers well of the area at the time she lived there. One that is fairly interesting is that there was a rambutan plantation, the De Souza Farm, right up Simon Road that was well known for its ‘seedless’ rambutans – rambutans with very small seeds. 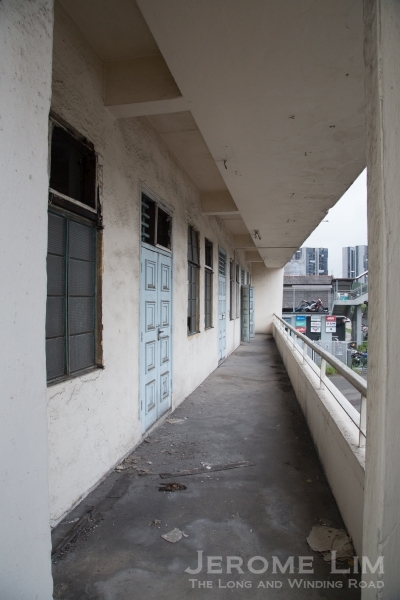 The area, which is identified today as a Teochew area, was also as it turns out, not exclusive to the Teochews and there was a large community of Eurasians that lived on Simon Road, many belonging to the Seventh Day Adventist congregation as a lot of land and houses there were owned by Seventh Day Adventists. My mother herself had lived in one of the houses owned by a Eurasian lady whose name she doesn’t remember, and mentions that in the same compound there was wooden house with a brick foundation (as many there were) in which the widow of a Seventh Day Adventist minister, whom my mother remembers as a Reverend Keasberry, lived and that house was later used as an old folks home for which a certain Mr Goodenough would do marketing for. Another thing that the area was well known for a hatchery which was further along upper Serangoon road (opposite Lim Ah Pin Road) which turns out to be the same one that an uncle of my brother-in-law ran. The area we see today is certainly one that is very different from the world that my mother describes. 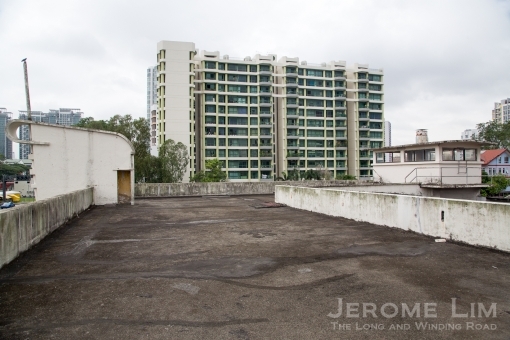 The old market for one was flattened some time back, and what now stands in its place is a newly completed condominium The Kovan and with that there is probably nothing but a few memories that is left of that old Simon Road where seedless rambutan trees once grew. 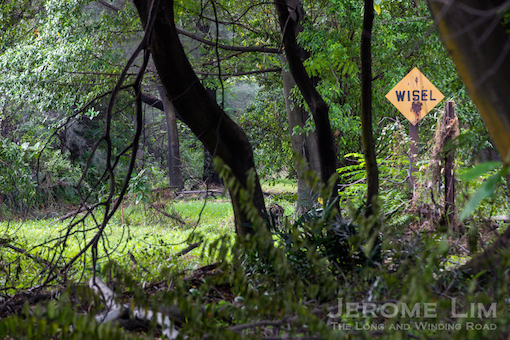 A road that would once have led to a rambutan plantation known for its 'seedless' rambutans.